On December 12, 1941, the Struma sailed from Constanza in Romania with 769 immigrants aboard. The vessel, commissioned by the New Zionist Organization and the Irgun, was the last to leave Europe in wartime. The ship was actually an old cargo barge used to carry cattle along the Danube and suited for no more than 150 passengers. The objective was to anchor in Turkey, and from there to await certificates for Palestine. The small, unseaworthy ship broke down several times and a trip that should have taken 14 hours took three days. The Turkish authorities prevented the disembarkation of the passengers for fear that the British would not give them certificates and Turkey would be forced to give them refuge. There was an acute shortage in food and drinking water, despite help provided by the Jewish community of Istanbul. The passengers suffered from cold, filth and hunger. The ship remained in Istanbul for 70 days while the Jewish Agency and the Joint Distribution Committee tried to convince the British government to allow the ship to bring the refugees to Palestine. The British refused to yield and pressured the Turks to return the ship to Romania to discourage future immigration from the Balkans. Despite the despairing appeals of the captain that the ship was unable to continue on its way, the Turkish authorities forcibly towed the Struma into the Black Sea on February 23, 1942. On the following day, a mighty explosion was heard and the ship went down. Later, it was determined the ship had been sunk by a torpedo from a Russian submarine. More than 100 passengers and crew went into the water where most froze or drowned. David Stoliar was among those who floated helplessly in the freezing Bosporus. His fiancé and her parents, along with 103 children, were among the dead. Stolier became so despondent he tried to kill himself by cutting his wrists with a pocket knife, but his hands were too swollen from the cold. A coast guard rowboat picked him up. He was the only survivor. Initially, he was taken to a military hospital in Istanbul before being jailed for being in Turkey illegally. After 71 days, the British government granted Stolier an "exception" and allowed him to enter Palestine. He learned his mother had been murdered at Auschwitz, but his father had survived and he brought him to Palestine. Jews were outraged by the sinking of the Struma. In a letter to the chief secretary of the Palestine government, John Macpherson, Moshe Sharett blamed the British government for its discrimination against Jewish refugees while allowing the entrance of non-Jewish refugees without any limit, and demanded that Jewish refugees should be allowed to enter Palestine without limitation, since they were escaping persecution and murder. 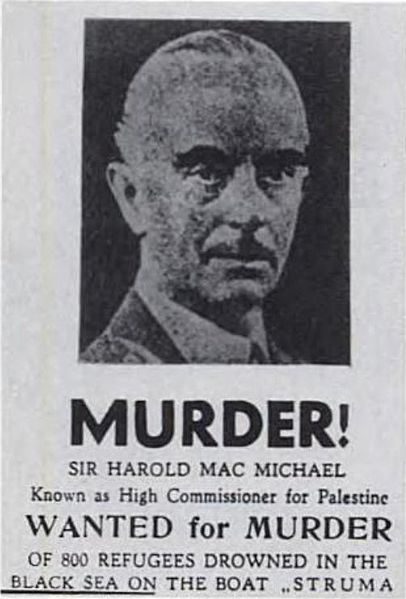 The British High Commissioner for Palestine, Harold MacMichael, was singled out for blame because of his opposition to allowing the ship to reach Palestine. The Irgun published a Wanted for Murder poster with his picture (the group tried to assassinate him in 1944) for his role in the Struma disaster. During the trial of Adolf Eichmann in 1961, a letter was found from his representative in Romania, Richter, which said that Mihai Antonescu, vice president and foreign minister of Romania, did not allow the Struma to leave Romania. Antonescu blamed the ship's departure on the head of the secret police, who was later fired. Richter also reported the refugees would be sent back to Romania. Sources: The Irgun Site, The Struma Project, Sarah-Honig, "A Doomed Journey," Jerusalem Post, (January 17, 1942); Israel State Archives; Marc Pitzke, “The Lone Survivor of the ‘Struma,’” Spiegel Online, (May 23, 2013). Photo believed to be of Struma from Wikipedia, Wanted Poster from Israel State Archives.